Karotu shubhaha murdhva ganadhipo mey!! 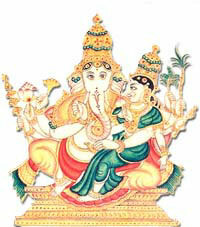 Urdhva Ganapati is a tantric form of Ganesha and is with a consort who sits on his lap. The goddess on the lap is of green color. The body tone of Urdhva Ganapati is golden. He has eight hands and holds, blue flower, paddy, lotus, sugarcane, bow and arrow, goad, broken tusk and grass sprout. There are no popular temples exclusively dedicated to Urdhva Ganapati form of Ganapati.